include a built-in cylinder lock. Easy Assembly: Components are pre-punched for easy assembly. 96 (double door) and a variety of depths. 1-½ x 1-½ 14-gauge angle frame. Frame: 2 x 2 14-gauge tube frame. Door:Industrial-grade hinged doors feature built-in cylinder lock. Installation:Ships knocked down or fully assembled. Click the Prices of the item you wish to purchase. 8000 Series require two shelves for each full-width level and one shelf for each half-width level. 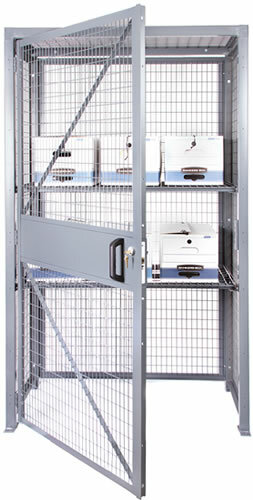 Tenant Lockers, Utility Cabinets, and Cabinets from your source for material handling equipment.